England 2-50 (Jonathan Trott 27, Nick Compton 12*, Trent Boult 2-26) trail New Zealand 443 (Peter Fulton 136, Kane Williamson 91, Steven Finn 6-125) by 393 runs. The New Zealand batting led by Peter Fulton and Kane Williamson posted a healthy total while Trent Boult held two quick English wickets as the hosts ruled the day. 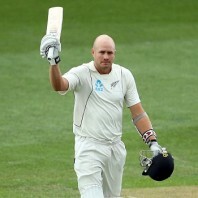 The Black Caps amassed 443 runs in their first innings and England managed 50 in 25 overs with 8 wickets in hand. The second day’s play came to an end on Saturday, March 23, 2013, at Eden Park, Auckland. Earlier, the hosts started the day at a rather comfortable position at 1-250 in 90 overs whereas Peter Fulton had smashed 124 and was assisted by Kane Williamson at 83 from the other end. Williamson started off with a couple of fours but was caught behind by Matt Prior off James Anderson on the fourth ball of the 95th over for 91 from 199 deliveries with 15 fours. The second wicket fell at 260 after contributing useful 181 runs as Ross Taylor appeared in the center. The English bowlers checked the run rate and the batsmen were unable to score freely and reached 278 after 105 overs. Taylor hit 1 six and 1 four in the first five balls of Monty Panesar but was caught and bowled on the last ball for 19 at the total of 289 runs. Steven Finn got rid of Peter Fulton eight runs later for 136 off 346 deliveries with 3 towering sixes and 15 fours. Dean Brownlie and the captain of New Zealand, Brendon McCullum, got together and picked up the runs rate. The boundaries started flourishing from the woods of both batsmen as McCullum added another two in the 128th over. Brownlie was sending the ball out of the fence from the other side as the score touched 365 in 132 overs. Brendon McCullum was gone for 38 and Brownlie followed him after the addition of just eight runs for 36 runs. Tim Southee scored 44 quick fired runs from just 33 balls with 2 smart sixes and 4 fours as the Kangaroos hammered 443 runs before they were bowled out in 152.3 overs. Steven Finn was the highest wicket taker with six, James Anderson held two whereas Monty Panesar and Jonathan Trott shared one wicket each. England lost their skipper, Alastair Cook, at just eight runs when he was caught behind by BJ Watling for four. He was replaced by Jonathan Trott who associated with Nick Compton as the first scored seven runs on the first two balls he faced. Compton hit 2 fours and the duo took the score to 29 after six overs. The batsmen added just two runs in the next four overs as Trott hit a four in the following over and was declared leg before wicket off Trent Boult for 27 off 44 balls with 4 fours. Ian Bell walked in next and hit a four on the very first ball he faced as Compton preferred to secure his wicket. The pair saw the day off by creeping to 50 after 25 overs whereas Nick Compton scored 12 from 72 balls and Ian Bell was at the other end for 6 runs. England still trails by 393 runs but most importantly has eight wickets in hand and their batsmen are capable of bouncing back whereas New Zealand will try to get a vital first innings lead by bowling out the visitors cheaply.